I venture beyond the city for three main reasons: 1) to swim at the BAC, 2) to eat Shabu Shabu, and 3) to take cooking classes at Whole Foods in San Mateo. For those of you who are just venturing into no-sodium cooking, or let’s face it, cooking in general, these classes are a real deal and a steal. 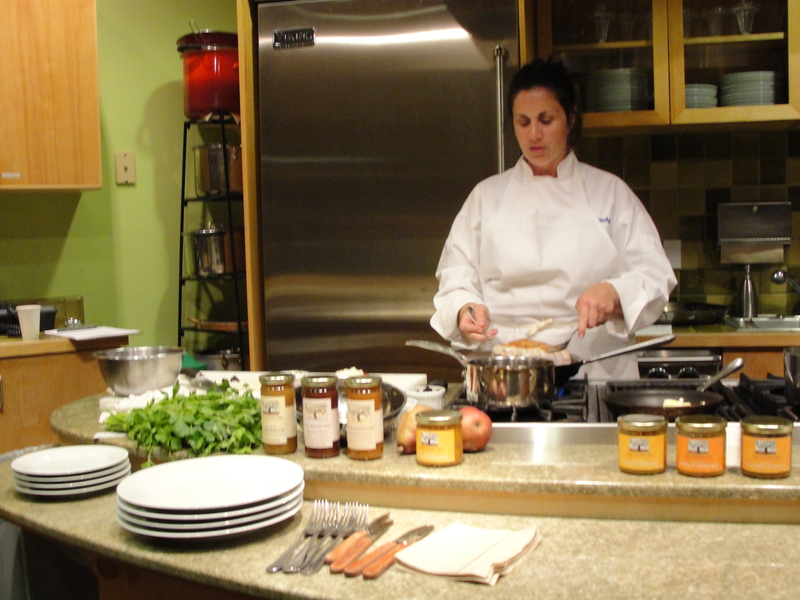 Most cooking classes in San Francisco are twice the price or higher. Eating a ton of fresh food. The classes are in the store, so they can easily accommodate dietary needs. Don’t eat red meat, they’ll just grab you a fish fillet. Meeting a ton of friendly faces. It’s all about teamwork people. Learning great cooking techniques and impressive nuggets of kitchen wisdom. And drinking as much free wine (or sparkling water) as you can possibly handle. Oh and I almost forgot, there is usually more than enough food for each participant to take home leftovers. Did I mention it was only $35? While I usually prefer the hands-on classes, I ended up attending a demonstration class with Frog Hollow Farm co-owner, Becky Courchesne. This pastry chef, with a penchant for fresh food and peach farmers, really knows how to cook. The evening’s menu was built around Frog Hollow Farm’s line of fruit toppings, a product that proved to be a true culinary chameleon. The peach, pear, and plum conserves dressed a Mesclun salad, stuffed a turkey, perked up a pork chop, fizzed in a holiday cocktail, and melted in a Filo dough, Mascarpone desert. Clearly these are not just for ice cream anymore. And what a wonderful way to enjoy stone fruit during the winter months. 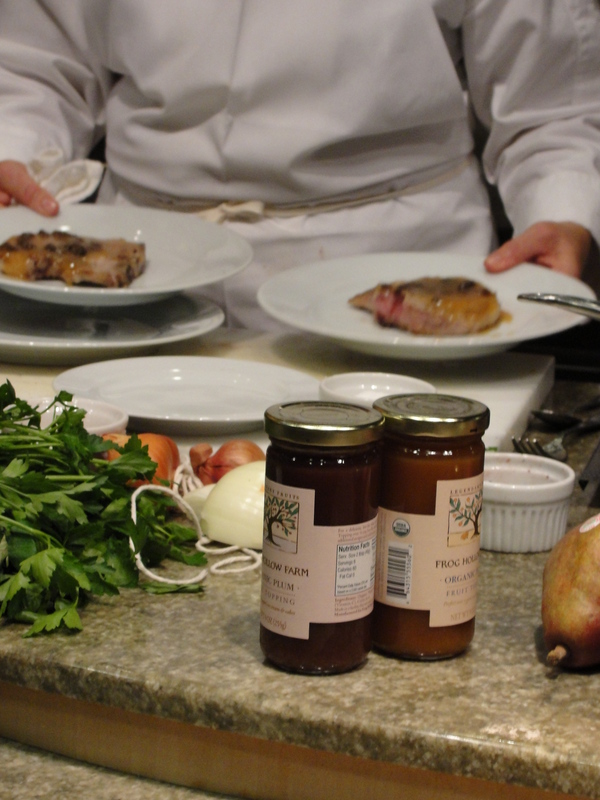 For those of you with dietary needs, the Whole Foods cooking classes are ideal. In every class I have taken, from Thai to Italian, the chef du jour was more than willing to accommodate my needs. They are usually quite small and as I mentioned before, the classes are in the store, so it is very easy for the chef to pick up unsalted products as needed. For the hands-on classes, I usually set aside my own salt free ingredients to make no sodium versions of the recipe. And last night, Becky was kind enough to cook my food separately so that I could enjoy her sweet and savory creations. 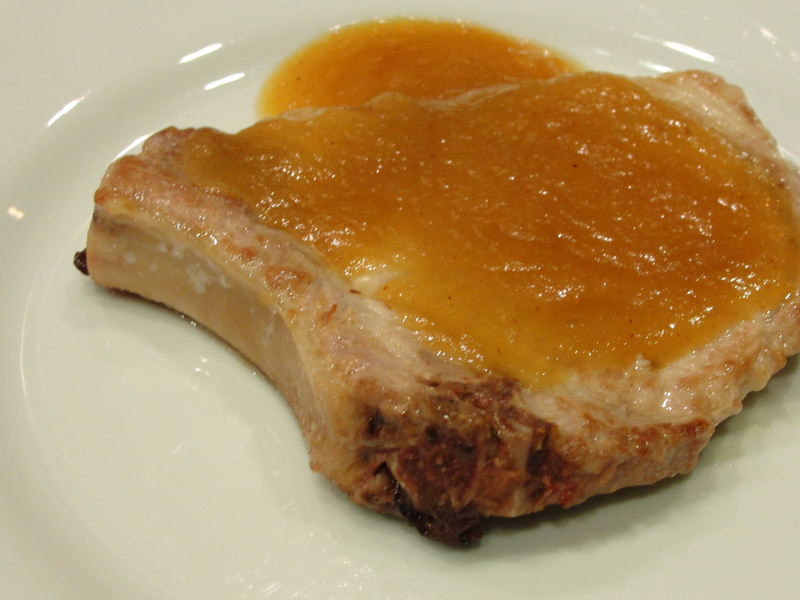 Just check out this sodium free chop with pear sauce. If you aren’t convinced yet, here are some other drool inducing shots. First, the Pear and Pt. 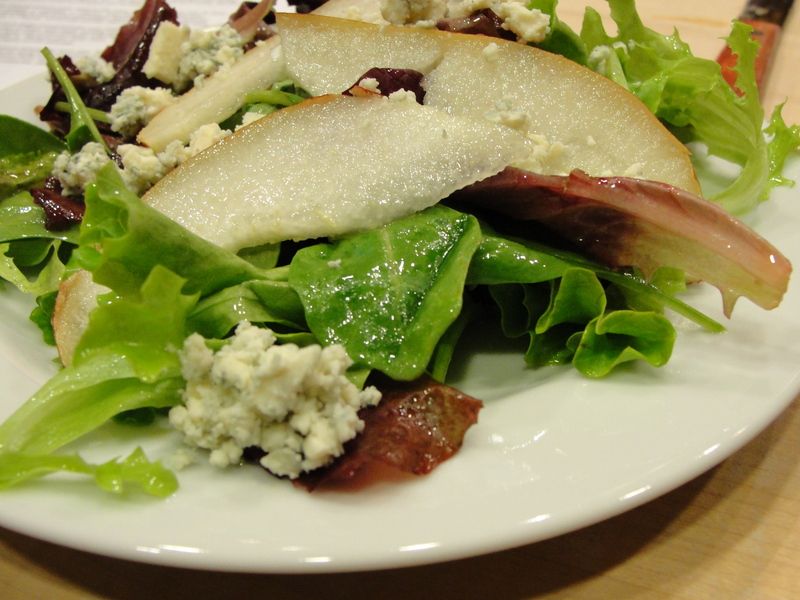 Reyes Farmstead Blue Salad. When making this at home, I would substitute the Pt. Reyes cheese for farmer’s cheese which is now being carried at Whole Foods and Bristol Farm. 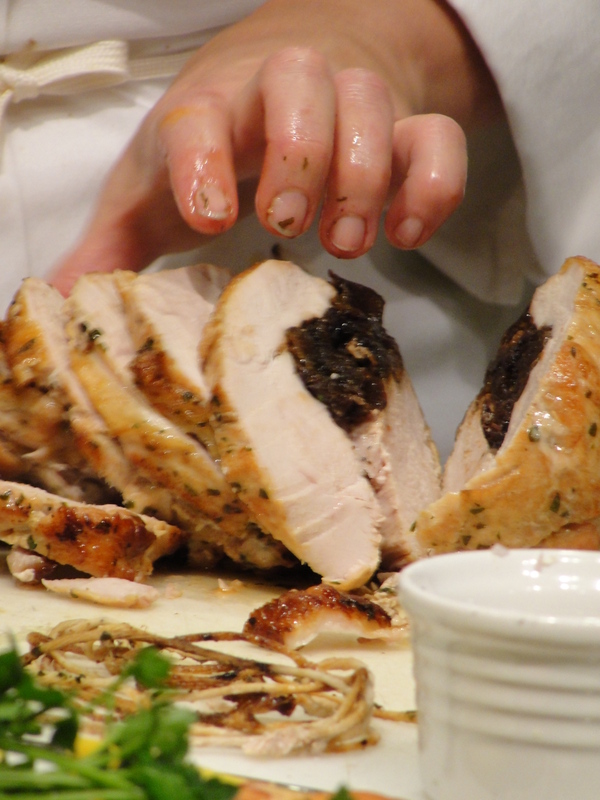 And then of course there’s the pan roasted turkey breast with plum sauce stuffing. Just make sure you buy turkey meat that has not been injected with a saline solution. Sadly, my camera died as soon as Becky started making the “Beggar’s Purses,” a devilishly simple but impressive dessert. But do not fret, recipes and more pictures to come next week as Boy and I try to recreate the menu for a very special dinner guest. Don’t you just love suspense?